Prices Exclude VAT UltraEdit Pricing in Ireland from AxonWare. Get UltraEdit Windows. Order Online from the leading UltraEdit Discount Reseller in Dublin Ph:+353-16535178. Best place to Buy UltraEdit. With millions of users and nearly two decades of development, UltraEdit is the go-to editor in a diverse range of industries for IT professionals' most important editing needs. From programming and coding in nearly any language, to large file manipulation, from data sorting and text record formatting to remote (FTP/SFTP) file operations. UltraEdit is a tool that no IT professional should be without. UltraEdit is considered a programming masterpiece for its quality, power packed features, unmatched performance, and ease of use. - Powerful search tools, including find/replace in files, regular expressions, inverse search, etc. - CSV data reformatting - and hundreds more. What industries can benefit from UltraEdit? UltraEdit is used across a diverse range of industries, from writers, researchers and journalists to programmers, database managers and web developers. What can UltraEdit do for a programmer or developer? Color coded editor, syntax highlighting, and bookmarks! 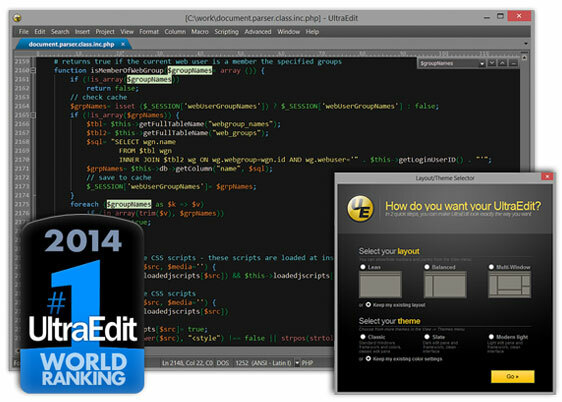 UltraEdit delivers easy viewing and editing of code and variables. In addition to the standard editing functions such as undo, copy and paste, and searching, UltraEdits color-coded editor allows programmers to decipher different code types and variables, and you are going to love the powerful code-folding too. Additional productivity enhancing features include delimiter matching that shows you the location of the opening and closing of parentheses, and bookmarking which helps you remember and find significant sections of code such as subroutines and constant declarations. A hallmark of UltraEdit text editor is its language-specific support. UltraEdit text editor also includes powerful CTAGS support. Build a project-specific ctag file with the option to create automatically when opened, with fully configurable parameters and tag file for use outside of projects. The find symbol command will locate any symbol in the ctag file of the selected item or the item under cursor and position it in appropriate file... That's the power of UltraEdit! When invoked, keywords from the syntax highlighting wordfile are listed in the conveniently located drop-down window. You can even specify your own file to provide the strings for auto-completion. Additionally, UltraEdit will search back 50K in the file for words that match a partially typed word and present these for your use. What can UltraEdit do for a system administrator? Replace text can even preserve the case of the original! Lightning fast search and replace. What can UltraEdit do for a technical writer? UltraEdit is used across a diverse range of industries, from professional web designers, software engineers, banking, tax and insurance professionals to IT, system administrators, researchers, pharmaceutical, civil/state/federal governments, and so many more. What can UltraEdit do for a banker or accountant? A hallmark of UltraEdit is its configurable toolbars and menus. Users can simply put the application in basic or advanced mode in a simple mouse click! UltraEdit is well-rounded with over 12 years of publication. With over two million registered users, it's highly seasoned and widely considered the defacto industry standard of text and programmers editors. UltraEdit is the ideal tool for opening and modifying EDI files which are common in the medical records industry. If you are looking for a way to format or reformat EDI files, look no further! For years, UltraEdit has been used by professionals and administrators for maintaining plain-text patient records in formats like EDI. With its powerful Find/Replace, column editing, data reformatting, macros/scripts, and hundreds of other features - there is no better editor for EDI files than UltraEdit. What else can UltraEdit do for a medical or pharmaceutical researcher? Use UltraEdit to develop and update websites, extract data from databases, reformat and standardize electronic text and program source code, data mine unstructured text reports, and thousands of other uses! UltraEdit is well-rounded with over 12 years of publication. With over two million registered users, it's highly seasoned and widely considered the de facto industry standard of text and programmers editors. What can UltraEdit do for a web developer? The dockable tag list allows you to define a set of tags that can automatically be inserted into a file. Designed in part for HTML, this allows text to be selected for automatic insertion of tags around the selected text. UltraEdit comes out of the box preconfigured with over 250 tags for HTML, 100 HTML special character tags, and 50 tags for Cold Fusion. With no program modification required, UltraEdit's built-in HTML Tidy feature spiders through code as statements and variables are executed so you can easily discover syntax and logic errors. The results are displayed in a scrollable output window that allows you to easily navigate to the offending lines of code. What can UltraEdit do for a professional writer/journalist? A hallmark of UltraEdit is its configurable toolbars and menus. Users can simply put the application in basic or advanced mode in a simple mouse click. - Includes UltraCompare Lite at no additional cost - a free diff tool!